Watching a butterfly ‘float’ is a bit disconcerting. It flaps its oversized wings furiously, a flurry of activity as it tries to stay in the air. This is certainly no wooden raft drifting leisurely down a stream; nor bald eagle gliding gracefully through the skies. In fact, as its body jerks awkwardly with each flap, it almost looks like its fighting for its life. If this is floating, then I dance like Fred Astaire. Tappity Tap. And about that tiny needle from a bee’s sting. Is that supposed to hurt? Strange choice of weapon, if so. I know, I know, the venom hurts more than the stinger itself, but still. I’d have picked a rocket launcher, a shotgun, some I don’t know, bombs or something- anything even slightly a bit more destructive. But hey- if it works for Muhammad Ali, it works for me. The Harmony 8 Pro works for me. The bass floats just like a butterfly- fast, furious and fighting fit. On the other hand the treble stings like a bee- a tiny prick, with a tingling feeling that lingers after. Overall the sound comes at you quick and fast, creating an explosion of sound as detail comes at you from every possible angle. Breathless from keeping up with the butterfly bass; ears still stinging a bit from the trebley-bee; and mind still reeling from the auditory input coming through; one wonders: was this what it was like to fight Muhammad Ali? You’d been active on Head-Fi and a fan of audio for a while, why take that jump from “critic” to “chef”, so to speak? Chasing a dream? Passion? Not finding the sound you wanted? Right now 3-person-team in total =) One person is responsible for soldering drivers and engraving your monitors and second is preparing shipments and is partially handling customer service. I started CA with 3000PLN – it’s around $1k. I’ve never got a bank credit and never used services like Kickstarter. Taking small steps at the time but pushing forward is more enlightening than doing big jump and possibly failing the landing. I think there are things that I wish we could do or develop if I had spare million or two, but I’m happy with what I have. Pushing big ideas with small capital is challenging but it’s also very encouraging and it motivates me. What have been some of the more key or interesting lessons along the way? Umm, that’s a fair question. I think understanding how to process the material and developing detachable cables system were one of the biggest steps. Purchasing certified measuring equipment was the most important step – it truly allowed me to play around with designs and test what’s going on with IEMs how do they really work. Interesting lessons… hmm definitely working on Single Phase design, especially when I hit the “of course that’s so obvious” and then “eureka” moments when developing Pro330v2. What is this “Single Phase” design? All drivers are connected in the same phase, but the goals (claims) of our design are a bit different from others who do this (and unfortunately I cannot give away details of this design). How did you go about thinking about a lineup? Well, early designs such as Music One, Pro100 and Pro210, Pro330v1 were to prove something, such as different tuning from the same driver, accuracy and smoothness or that 3 drivers can take on 6-driver competitors from big-brands. Music Two is simply an upgrade, Pro330v2 resolves the technical issues of Pro330v1. Then we phased out Pro210 and Pro100 because of poor sales, M1, M2 and Pro330 overtook those two by great margin. I decided to keep only those IEMs that people wanted to listen to. Do you actually think this industry is driven more by actual innovation and performance, or by marketing skill? Or what would you think is the % of each? It’s good that you’ve asked the second question. Because I think each of those are factors. I think performance is the most important when it comes to product itself, however my approach was more outside the box. I focused more on relation with customers and I mean relations, so it’s not just good customer service I actually made few good pen-pals. I like to be close to my customers to take care of each and everyone and I really enjoy this as much as making IEMs. So we are always praised for how good our customer service is. CA is not a company that sells products with big words and big claims. I don’t use words like “the best in the world” etc. “the most advanced in the world”, “it took us 10 years to develop”. Those are very buzz-feed-like catchy phrases that leave you underwhelmed with the product. We recognize other manufactures, we are keeping our statements true and cross-checked with reality to avoid claiming false. Sometimes we direct our customers toward different brands if we are sure that what they are looking for is not in our range. Another important thing is finish/look/design and the whole experience that comes along with product itself. I wanted minimalist products that are eye catching and stand out in the crowd. 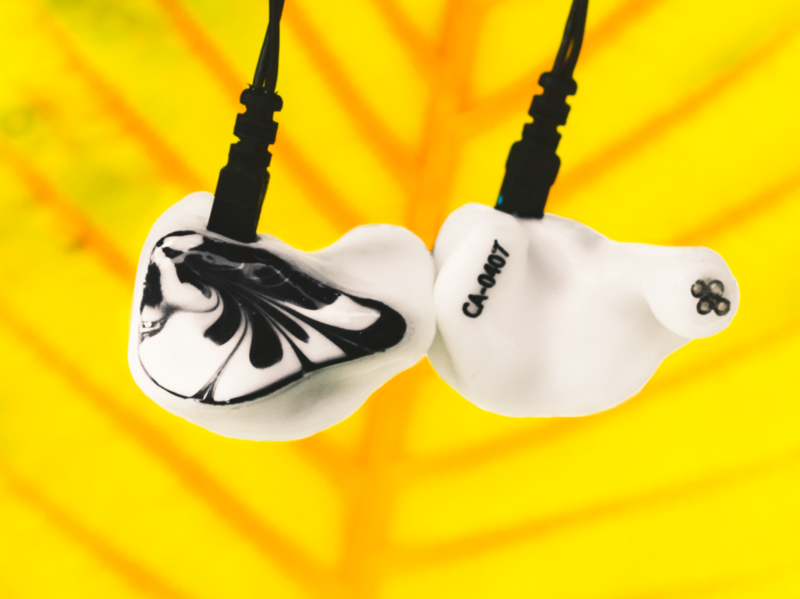 Silicone cIEM market was quite boring you could only select few colors, and there were no extra options, we broke this by offering high range of colors (over 30) with exciting designs such as wood or carbon, matte finish etc. Of course that had to go with very good sound. In my opinion, it would be something like this 45% customer care, 35% sound vs price ratio vs product quality in general; 20% innovation and being up to date with what customers want. Each of those will drive the marketing. Where do you see the most potential for innovation when it comes to IEMs? Each of the innovation you see in the industry recently has different purpose and pushes industry further and further. More drivers are the least innovative thing you can do, though. Number of drivers is not as important as careful selection of driver types or driver model. IMHO the future is in active crossover and DSP. Any other technologies or interesting ideas you’re keen on? Well I think the future itself is in drivers. Right now (or should I say STILL) majority of drivers for audio are simply slightly tweaked hearing aid receivers. There are very few TRUE pro-audio receivers that were built from ground to be used only in high-end IEMs. In IEMs that use few crossover points it would be nice to have driver that (by design) cover only 10-200Hz (more like speakers) than what we have now – typical BA woofer cover easily 10Hz-5kHz with 10dB difference between levels. Right now industry uses mainly full-range or at least semi-full-range drivers that happens to be better at given range. Is anyone creating these specialised hi-end audio drivers today? Well, Sonion, Knowles, Molex and few smaller manufacturers, also Sony. I’d say Sony is the closest to this because they created BA for their audio products. What kind of tuning were you going for, that you would consider your ‘perfect sound’ or ‘house sound’? The Harmony 8 Pro is pretty much ‘perfect’ for me. There’s not much more I would wish from my IEMs. It’s very balanced, it has bass that I love and clear liquid mids, it sounds spacious, airy and when amped right it’s smooth and sounds like an open headphone. In addition, if you check reviews of our product the most common thing mentioned is “balance”. I think I would pick both Music One and Harmony 8 Pro to show what our house-sound is. The most important thing for me are emotions in sound. We make IEMs to enjoy music not an equipment. If the IEM conveys emotions and you start tapping your toes, bang your head, dance, air band – our goal is achieved =) The second thing is balance. For Music One – simply because people were always telling me “single armature cannot sound good” or “single BA cannot cover the whole spectrum” and I think Music One proves those statements wrong, not only it sounds good with decent bass, smooth mids and highs, open soundstage and vivid presentation but also covers 10-17500 range easily. For Harmony 8 and 8 Pro the aim was a bit different, we needed a Flagship that combined features of Pro and Music series, so accuracy, musicality and somehow to be still within our house-signature. It also had to be real Flagship with no-compromise design, it had to be the best we’ve done up to date, with the most broadband frequency – basically all maxed out in terms of possible sound quality.